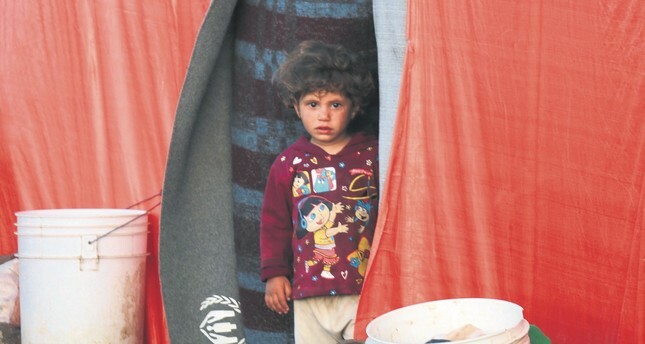 A displaced Syrian child, from the province of Daraa, in a makeshift camp near the border between the Israeli-occupied Golan heights and Syria, July 3. Dark smoke rose over areas held by Syrian opposition groups near the border with Jordan yesterday as Bashar Assad's Russian allies unleashed heavy air strikes and government forces sought to advance on the ground, escalating the ongoing humanitarian crisis. The Syrian Observatory for Human Rights, monitoring the war through what it describes as many sources on the ground, said there had been 600 air strikes in 15 hours, extending into yesterday's early hours. The latest wave of attacks comes after a four-day calm had prevailed in the area as the opposition negotiated with the Russians about how to end the violence in Daraa, which was the cradle of the Syrian uprising in 2011. The airstrikes resumed on Wednesday afternoon after the talks collapsed. The heavy airstrikes and shelling in southern Syria are putting the lives of 750,000 people in danger, U.N. refugee chief Filippo Grandi said. Most of the more than 320,000 people who have fled the attacks by Syrian regime forces and its ally Russia are forced to camp in open spaces or makeshift shelters, according to the U.N. high commissioner for refugees. "I call on all parties to redouble efforts to cease hostilities, to allow humanitarian actors to deliver life-saving assistance, shelter and evacuate the wounded," Grandi said, calling for a political solution, as reported by Reuters. He said Jordan should open its borders to let in fleeing Syrians, while the international community should provide Jordan with immediate support to host these new refugees. Assad aims to recapture the entire southwest including the frontiers with Israeli-occupied Golan Heights and Jordan. The area is one of the last opposition strongholds in Syria after more than seven years of war. For Assad, the Daraa campaign holds out the prospect of reopening the Nassib crossing with Jordan, a vital trade artery. Once Daraa is captured, the campaign is expected to move into the Quneitra area closer to the Golan frontier. Recovering the frontier with the Golan Heights is also important to Assad who sent reinforcements to the Golan frontier on Sunday. State TV said yesterday's bombardment had targeted the southern parts of Daraa, a city long split between the opposition and the army, and the towns of Saida, al-Nuaima, Um al-Mayadan and Taiba. Its correspondent said the army aimed to drive southwards through the area immediately east of Daraa, where opposition territory narrows to a thin corridor along the Jordanian border. This would split the territory in two. The army has been trying for days to reach the Jordanian border in the area immediately west of Daraa, but had not succeeded in attempts to storm an insurgent-held air base there, the opposition command center Twitter account said. Fleeing civilians have mostly sought shelter along the frontiers with Israel and Jordan, which is already hosting some 650,000 Syrian refugees. Both countries have said they will not open their borders, but have distributed some supplies inside Syria. Near the start of the regime's offensive, Washington indicated it would respond to violations of that deal, but it has not done so yet and opposition said it had told them not to expect American military help.